The Alvin Museum Society's constitution was adopted on April 12, 1976. The Society's stated mission is "to preserve the history of Alvin and its immediate area by heightening residents' awareness of the value of saving the past for the benefit of the future. Exhibits, programs, and activities that educate the museums' patrons are offered. Selected for preservation are structures, objects, documents, photographs, oral and visual histories, and all artifacts that add to the telling of Alvin's story." The Society owns and operates the Marguerite Rogers House Museum and the Alvin Historical Museum both of which are open for touring. 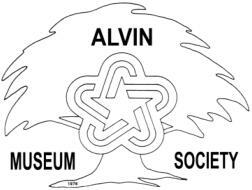 Alvin Museum Society general membership meeting is set for Sunday, October 24, 2010, at 2:00 p.m. at the Alvin Senior Ceter west wing. The program will be presented by Mr. Harold Gaul, current president of the Texas Historical Cemetery Guardianship Association. This is a group of people dedicated to locating, recording, and preserving all the cemeteries in Brazoria County. They have put together a database of over 34,000 names of those who are buried in 163 cemeteries in this county. Please join us for this very intersting program There will be refreshments and announcements, but no business meeting.